You can join any class during the week or weekends, our teachers speak English! 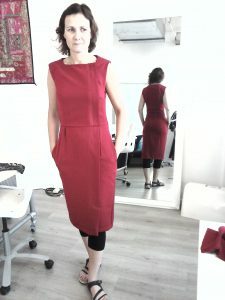 During the English sewing class you’ll learn at your own level how to make a garment on your own. Now you can design exactly that garment you would like to have and this made ​​for your body. Of course you can also sew anything other than clothing, such as a handbag, baby carrier for your baby, clothes for your children or pillows for your interior. Because everyone is working on his own project, different levels in a class work together. You will be guided personally, therefore there is a maximum of 6 people per teacher. Minimum of 3 months of participation, notice of one month (before 15th). Price is based on lessons every week except for (school) holidays. It’s not possible to catch up the lessons you’ve missed.